A National Reconnaissance Office payload lifted off Wednesday onboard a United Launch Alliance-built Delta IV rocket as part of the NROL-45 mission in support of national defense. The payload’s launch from Vandenberg Air Force Base in California marks the Boeing–Lockheed Martin joint venture’s second launch this year, ULA said Wednesday. The Delta IV rocket used in the mission consists of a composite payload fairing, a booster core supported by Aerojet Rocketdyne-built RS-68A engine, two Orbital ATK-made GEM-60 solid rocket motors and an upper stage powered by Aerojet’s RL10B-2 engine. Aerojet Rocketdyne said its propulsion system also consists of 14 helium pressurization tanks and multiple attitude control thrusters in addition to the main and upper-stage engines. Aerojet Rocketdyne’s Arde subsidiary also supplied the pressure vessels used on the rocket’s first and second stages. 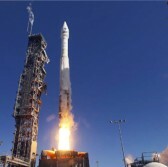 ULA said it is scheduled to launch on March 22 the Orbital ATK-built OA-6 Cygnus space vehicle aboard Atlas V to deliver cargo to the International Space Station under the Commercial Resupply Services contract with NASA.